In the slatestone Cevennes there's such a harmony between landscape and architecture that it looks like the constructions are grown instead of built, grown out of the rough rocky nature. the sheep- and goatsfolds ( les jasses) but also the farms, the so-called "mas" ,the hamlets, the villages, the churches and the little castles, they all are in perfect harmony with the environment. The traditional rural architecture is purely created out of natural materials: slatestone and chestnutwood available at the spot. The knowledge of materials and technics has been transmitted during centuries, always improving and anticipating to new demands. Caracteristic to this region is the culture on terraces, the chestnut-trees, its avowed relief and its clement climat due to the Mediterranean influence. The most buildings are constructed halfway the slope and if possible just beneath a source. The walls of terraces (les murs des bancels ) fertile earth all transported by men out of the river-bed hold by loose lying stone-walls (des murs en schistes, pierres sèches) allied between them by stairs integrated in the walls. Also at very inaccessible places there' have been created terraces, everywere where there was water or water to bring. Close to the house waterreservoir, kitchen garden and orchard..
A chestnut-orchard with grafted trees for fruits at a terrain that follows the slope, only sometimes they've built little halfround walls just beneath the trees to collect the leaves; a replacement for straw. And high above the heath( les landes) to the crest for goats and sheep to graze. The old paths connecting all farms and hamlets, often bordered by walls to keep the herds out of culture ground and chestnut orchard. The caracteristic mulberry-tree to feed the silkworms. The trellis-work for the grape culture: ‘clinton’, ‘jacquet’, ‘baco’ and other hybride sorts. The apiary with the old beehives out of a hollow chestnut-trunk with a big slatestone. The sepulchres close to the houses (due to persecution of the protestants) often with a cipres symbolising the flame of eternity. To economise fertile ground they sometimes also have buried their defuncts in courtyard or caves. The little square houses (les clèdes) to dry chestnuts( blanchettes), the main food for the cévenols during centuries. Sometimes integrated in the mas, sometimes isolated, close to the chestnuts-orchard spreaded out in the landscape.breadoven. 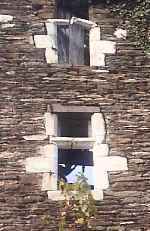 The bread-oven in the courtyard or integrated in the chimney gable with its entrance in the chimney. The threshing-floor to threat the rye, the cereal which florish well in light-acid ground (total absence of chalk). The dwelling of rectangular plan leans on the rock and even is partially integrated in it in the most of the cases. The oldest ones, from the year thousand when monks out of the Gevaudan and the Languedoc came installing here modest priories, always are perpendicular at the mountain . The extensions were firstly realised by preference by elevation, which presented the least material, work and upkeep. Besides earth was economized and man avoids this way to create a new seat in the slatestone rock, a slippery and breakable stone. The house is stacked up by following the terraces, thus every floor is ground floor at one side. The almost autarkic history of each farm evoluates with the agricutural demands and modifies with each wave of population-increase (16th, 18th and a maximum in the 19th centurie). In these demographically positive periods future potential neighbours were foreseen in the constructions by sticking out stones in the angles to support and connect the walls. In general a new wing is built perpendicular at the previous building, parallel with the mountainslope. To avoid the roof to be ajusted in ‘L’- form often a difference in height is chosen so the highest roof drains at the lower one. With all the extensions made in different periods for persons, goats, sheep, rabbits, pig(s), donkey, chickens and material, this results in a cascade of roofs differing in direction and height. Sometimes the extensions at more prosperous farms don't encircle the first construction but evoluates in more open plans like a L, F, H, U, two parallel wings or enclosing a courtyard. New buildings can also be detached with or without any special structure. Everything depends on period, terrain and constructor. Also the dimensions af all these prototypes of constructions change, in general we can see they grow bigger in time with the progress of technical know-how depending on the financial possibilities. The technical progres, the need for a lot of windows to maintain a constant temperature for the silkworms and the closedown of the taxes at openings gave architecture a new appearance. The lowest floor partially in the rock were water is thrickling out serves for goatstable or cave. The water is open canalized outside. The first floor is occupied by kitchen / living with a very big chimney in the gable at the mountain side. Opposite there is a window looking out over the valley. The second floor or even the third one, if there are, are for storage , magnanerie or bed-room depending on period and demands. The house follows the mountain which is given form in terraces and has groundfloors acces at each level . The kitchen-entrance consists usually of a stone stair outside, going up between the entrances of the caves. At some places you can see in the slatestone rock cutted foundations (les pèdes) not in depth like usual but in relief. But mostly the constructions joined to the whole ( first very simple but later on more and more complex and personalised) take walls or parts of them like seat. This way outside walls become inside ones. Every mas, hamlet or village has got very old parts just started at the rock like it was , and a lot of changes during every following period. 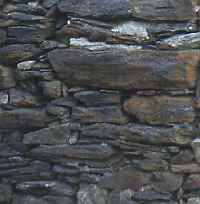 The jonction and seat :of the walls depends on the quality of the rock and the quality of the construction method. The attention paid to the seat is of essential importance to the age of a wall, especially in slatestone with its slippery and breakable nature. Where the foundation is not made correctly walls often fall down. Certainly the terrace-walls built without mortar are concerned by this problem. Also rains, treeroots and the big number of wildboars are destructive factors. A lot of (parts of) walls have come down by the collapse of the roof, caused by lasting leaking and putrefiying of the main beams or by a heavy load of snow. In spite of all kinds of erosion influences we can say with pleasure that the most of the mas and bancels are still intact and bear witness to an extraordinairy patrimony of a confectionated landscape. Above the lintels there are two kind of open spaces in the slatestone to avoid the weight of the wall pushing at the lintel. The oldest one is a rectangulair space the later version is a triangle. Every construction can be said to be functional and inventive and shows attention to details, personnality and harmony. Schist, sombre and shining with golden, silver or bluish reflects, can easily be recognized by its stratified puff-pasty and folded aspect. So mica might be white in cristal-form more or less big: muscovite or sericite. She can also be black in scaly-form: biotite, or rust-coloured by ironoxide. Schist varies a lot from one valley to another. The little white layers in between the strata of schist are accumulations of quartz which are old layers of cristalized sand.retour . 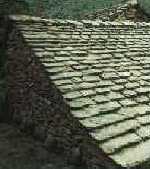 Even the roof is made out of slatestone ( les lauzes) , the beams and the rest of timber are chestnutwood . The main force is demanded of the ‘tirants’- the beams perpendicular at the walls who keep the building together. These are fixed by dovetails in the‘sablières’-the beams laying at the top of the wall. The ridgepole( la panne sablière) is hold by big triangulairs "les entraits", and the weight of the slates are carried by chestnuttimber supported by a lot off little beams (les chevrons). Only one thirth of the slatestones is visible. Water is of vital importance since always, and for ever. The cévenols have constructed a very ingenious system to regulate the water-household, with two purposes : to have and to avoid water. The main need for water was for agriculture purpose for cattle and irrigation. The second need was stocked water for hydraulique energie ( mills, forges, spinning-mills forges, …) but also drinking-water and a little water for washing and cleaning. To avoid water and damage by heavy rains and inundations they've built and cut out of the rock a lot of amazing constructions. taps with stones to regulate the exactly determined hours and quantities of water. cask, vats and basins in mortar and stone, all the other aqueous constructions works are purely realised only in stone..